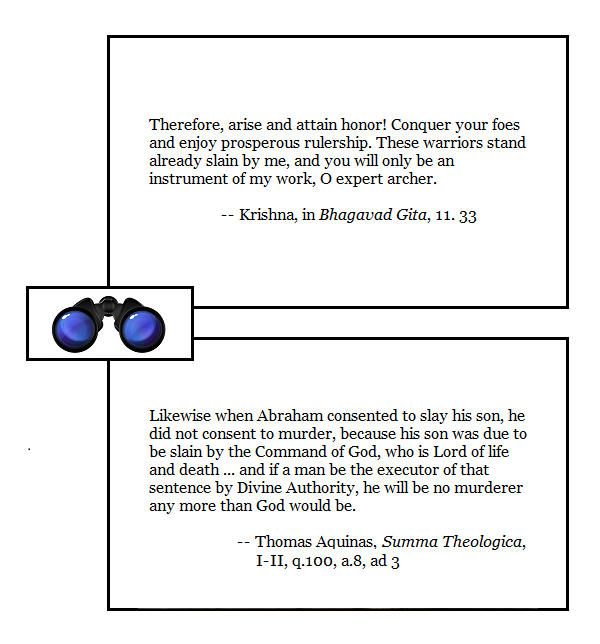 It is noteworthy that Arjuna does in fact kill those he has been ordered to kill, and that in contrast Abraham is reprieved from the necessity of killing his son by the same divine authority which had first demanded that extraordinary sacrifice — but God (the Father) in the Christian narrative goes on to kill his own Son in what is both the perfection and completion of sacrifice..
And from the perspective of military chaplains blessing members of the armed forces on their way into battle in a just war, the same divine approval presumably holds. But are wars ever just? Foreign Policy, What Happens When You Replace a Just War With a Just Peace?